What Is the Model Discretizer? Model Discretizer selectively replaces continuous Simulink® blocks with discrete equivalents. Discretization is a critical step in digital controller design and for hardware in-the-loop simulations. You must have a Control System Toolbox™ license, Version 5.2 or later. The f14 model shows the steps in discretizing a model. 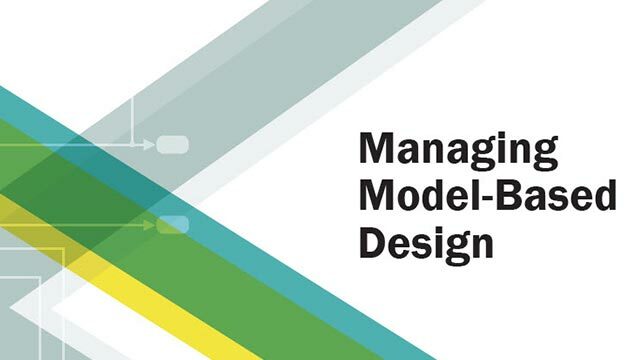 To open the tool, in the Simulink Editor, select Analysis > Control Design > Model Discretizer. The Simulink Model Discretizer opens. Alternatively, you can open Model Discretizer from the MATLAB® Command Window using the slmdldiscui function. To open a new model or library from Model Discretizer, select File > Load model. The transform method specifies the type of algorithms used in the discretization. For more information on the different transform methods, see the Control System Toolbox. Zero-order hold on the inputs. Tustin approximation with frequency prewarping. Matched pole-zero method (for SISO systems only). Enter the sample time in the Sample time field. For the Model Discretizer, this value must be numeric. You can specify an offset time by entering a two-element vector for discrete blocks or configurable subsystems. The first element is the sample time and the second element is the offset time. For example, an entry of [1.0 0.1] would specify a 1.0 second sample time with a 0.1 second offset. If no offset is specified, the default is zero. You can enter workspace variables when discretizing blocks in the s-domain. See Discrete blocks (Enter parameters in s-domain). Creates a discrete block whose parameters are retained from the corresponding continuous block. Creates a discrete block whose parameters are “hard-coded“ values placed directly into the block's dialog. Create multiple discretization candidates using s-domain values for the current selection. A configurable subsystem can consist of one or more blocks. Create multiple discretization candidates in z-domain for the current selection. A configurable subsystem can consist of one or more blocks. Discrete blocks (Enter parameters in s-domain). Creates a discrete block whose parameters are retained from the corresponding continuous block. 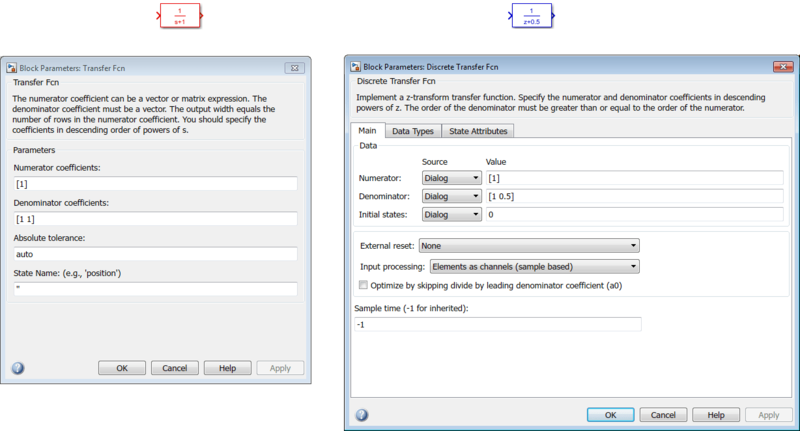 The sample time and the discretization parameters are also on the block's parameter dialog box. The block is implemented as a masked discrete block that uses c2d to transform the continuous parameters to discrete parameters in the mask initialization code. These blocks have the unique capability of reverting to continuous behavior if the sample time is changed to zero. Entering the sample time as a workspace variable ('Ts', for example) allows for easy changeover from continuous to discrete and back again. See Specify the Sample Time. If you generated code from a model, parameters are not tunable when Default parameter behavior is set to Inlined in the model's Configuration Parameters dialog box. The following figure shows a continuous Transfer Function block next to a Transfer Function block that has been discretized in the s-domain. The block parameters dialog box for each block appears below the block. Discrete blocks (Enter parameters in z-domain). Creates a discrete block whose parameters are “hard-coded” values placed directly into the block's dialog box. Model Discretizer uses the c2d function to obtain the discretized parameters, if needed. The following figure shows a continuous Transfer Function block next to a Transfer Function block that has been discretized in the z-domain. The block parameters dialog box for each block appears below the block. If you want to recover exactly the original continuous parameter values after the Model Discretization session, you should enter parameters in the s-domain. Configurable subsystem (Enter parameters in s-domain). Create multiple discretization candidates using s-domain values for the current selection. A configurable subsystem can consist of one or more blocks. The Location for block in configurable subsystem field becomes active when this option is selected. This option allows you to either create a new configurable subsystem or overwrite an existing one. The current folder must be writable in order to save the library or libraries for the configurable subsystem option. Configurable subsystem (Enter parameters in z-domain). Create multiple discretization candidates in z-domain for the current selection. A configurable subsystem can consist of one or more blocks. Configurable subsystems are stored in a library containing the discretization candidates and the original continuous block. The library will be named <model name>_disc_lib and it will be stored in the current. For example a library containing a configurable subsystem created from the f14 model will be named f14_disc_lib. If multiple libraries are created from the same model, then the filenames will increment accordingly. For example, the second configurable subsystem library created from the f14 model will be named f14_disc_lib2. You can open a configurable subsystem library by right-clicking on the subsystem in the model and selecting Library Link > Go to library block from the context menu. To discretize blocks that are linked to a library, you must either discretize the blocks in the library itself or disable the library links in the model window. You can open the library from Model Discretizer by selecting Load model from the File menu. You can disable the library links by right-clicking on the block and selecting Library Link > Disable Link from the context menu. There are two methods for discretizing blocks. Select a block or blocks in the Model Discretizer tree view pane. To choose multiple blocks, press and hold the Ctrl button on the keyboard while selecting the blocks. You must select blocks from the Model Discretizer tree view. Clicking blocks in the editor does not select them for discretization. Select Discretize current block from the Discretize menu if a single block is selected or select Discretize selected blocks from the Discretize menu if multiple blocks are selected. You can also discretize the current block by clicking the Discretize button, shown below. Enter the discretization settings for the current block. This adds the current block with its discretization settings to the group of preset blocks. Repeat steps 1 and 2, as necessary. Select Discretize preset blocks from the Discretize menu. You can delete a discretization candidate from a configurable subsystem by selecting it in the Location for block in configurable subsystem field and clicking the Delete button. To undo a discretization, click the Undo discretization button. Alternatively, you can select Undo discretization from the Discretize menu. This operation undoes discretizations in the current selection and its children. For example, performing the undo operation on a subsystem will remove discretization from all blocks in all levels of the subsystem's hierarchy. Model Discretizer displays the model in a hierarchical tree view. The block's icon in the tree view becomes highlighted with a “z” when the block has been discretized. The following figure shows that the Aircraft Dynamics Model subsystem has been discretized into a configurable subsystem with three discretization candidates. The other blocks in this f14 model have not been discretized. The following figure shows the Aircraft Dynamics Model subsystem of the f14 example model after discretization into a configurable subsystem containing the original continuous model and three discretization candidates. The following figure shows the library containing the Aircraft Dynamics Model configurable subsystem with the original continuous model and three discretization candidates. To refresh Model Discretizer's tree view of the model when the model has been changed, click the Refresh button. Alternatively, you can select Refresh from the View menu. You can replace continuous blocks in a Simulink software model with the equivalent blocks discretized in the s-domain using the Discretizing library. The procedure below shows how to replace a continuous Transfer Fcn block in the Aircraft Dynamics Model subsystem of the f14 model with a discretized Transfer Fcn block from the Discretizing Library. The block is discretized in the s-domain with a zero-order hold transform method and a two second sample time. Open the Aircraft Dynamics Model subsystem in the f14 model. Open the Discretizing library window. Enter discretizing at the MATLAB command prompt. The Library: discretizing window opens. This library contains s-domain discretized blocks. Add the Discretized Transfer Fcn (with initial states) block to the f14/Aircraft Dynamics Model window. Click the Discretized Transfer Fcn block in the Library: discretizing window. Drag it into the f14/Aircraft Dynamics Model window. Open the parameter dialog box for the Transfer Fcn.1 block. Double-click the Transfer Fcn.1 block in the f14/Aircraft Dynamics Model window. The Block Parameters: Transfer Fcn.1 dialog box opens. Open the parameter dialog box for the Discretized Transfer Fcn block. Double-click the Discretized Transfer Fcn block in the f14/Aircraft Dynamics Model window. 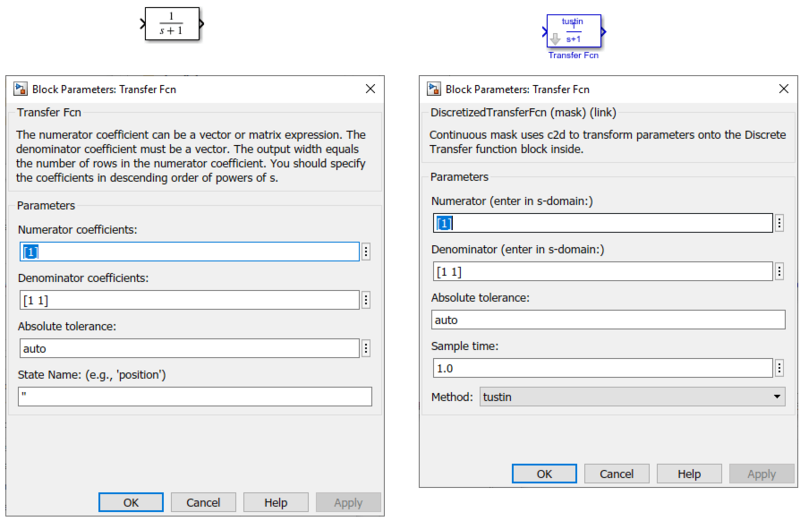 The Block Parameters: Discretized Transfer Fcn dialog box opens. Copy the parameter information from the Transfer Fcn.1 block's dialog box to the Discretized Transfer Fcn block's dialog box. Enter 2 in the Sample time field. Select zoh from the Method drop-down list. The parameter dialog box for the Discretized Transfer Fcn now looks like this. The f14/Aircraft Dynamics Model window now looks like this. Delete the original Transfer Fcn.1 block. Click the Transfer Fcn.1 block. Add the Discretized Transfer Fcn block to the model. Click the Discretized Transfer Fcn block. Drag the Discretized Transfer Fcn block into position to complete the model. Use the sldiscmdl function to discretize Simulink software models from the MATLAB Command Window. You can specify the transform method, the sample time, and the discretization method with the sldiscmdl function.